Well, this is the last bread of Bourbon week. 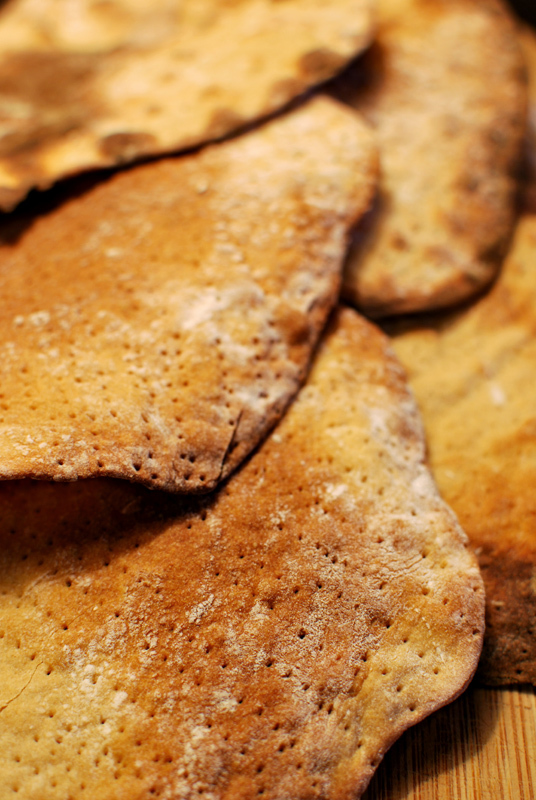 And you may be wondering what in the world matzo has to do with Bourbon. Well… nothing. Nothing at all. But it is the first day of Hanukkah, and even though I’m not Jewish, I hate to see a holiday go uncelebrated. Yes, I’m aware that it’s the wrong holiday for this bread. I know! And I’m sure that it’s borderline offensive to be featuring this bread on Hanukkah; but I flat out missed Passover, and I hated to go this whole year without featuring one of the more famous breads out there. So, with great apologies to the whole Jewish community, here I give you matzo. On Hanukkah. And, I’m incredibly sad to report, it did not turn out well. It was probably my own fault, as I may have rolled the dough too thinly, or perhaps not thinly enough. It’s hard to say with directions like “as thin as you can”. Whatever the case, I didn’t think mine were done at the improbable 3 to 5 minute mark, as they looked doughy and pale, and so baked them for at least twice that. After that, they were browned and crisp upon removing from the oven, but cooled into a state of leathery toughness, fit for nothing but thickening soups or turning into bread crumbs. So I give you this recipe in hopes that you’ll have more success with it than I did; this was, in all fairness, my first time making matzo. So how, you may ask, does this relate in any small way to Bourbon week? Well, I had originally planned to make some Matzo Toffee Crunch, using a reasonable amount of Bourbon in the toffee. It was going to be a pleasant departure from the monotony of bread, bread, bread, and might offer you a suggestion for a homemade holiday gift. Bonus: it ties in with Bourbon week! We all win! But then, my matzo turned out nearly unpalatable, and I wasn’t about to waste Bourbon toffee on the stuff. So if any of you Gentle Readers out there have a burning desire to make this creation of mine, I would be thrilled to go buy a box of matzo and test a batch for you. It’s really the least I could do. So apologies for this half-baked post (no pun intended); tune in next week for some special holiday treats! I promise, they’ll be worth your while. 1. Preheat the oven to 475º F. Line two baking sheets with parchment paper. 2. When the oven has fully preheated, mix together the flour and water. Knead briefly until the dough comes together into a smooth ball, about 4 minutes. If the dough sticks to your hands or the work surface, add additional flour by spoonfuls as needed to prevent sticking. 3. Divide the dough into 8 to 12 even pieces. Keeping the unused pieces covered, roll out the dough on a lightly floured surface with a rolling pin, as thin as the dough will allow. 4. Transfer the dough to a prepared baking sheet, and dock all over with a fork, to prevent the dough from puffing in the oven. Repeat with remaining dough until one baking sheet is full. The breads won’t spread, so you can put the dough as close together as you like. Bake until crisp. 5. While the first batch is baking, prepare the second batch. Continue baking and rolling until all the dough has been cooked. 1. If you don’t need to keep kosher, you can add a teaspoon or two of salt, honey, spices, or olive oil to the dough. This entry was posted in Savory, Unleavened Breads. Bookmark the permalink.